nice ondeh ondeh Gert .. now puasa is around the corner I'm collecting recipes for breaking fast and Raya :)btw Gert do you perchance have any tried and tested recipe for serunding daging ? ..
Nice Onde-Onde ya. Can I have some? Envy, there is a serunding daging recipe in my blog in the month of July. oh lovely onde onde , please mdm can I have some ? i call them kuih melaka and theyr usually green. heehhe. hmmm.. dunno why the water turned to green rather than purple. x-files case? Pearly, thanks. How many biji you want? PJ, I am also used to the green ondeh ondeh but since I found the purple one so I used it. If you come across any of these give it a try. Is so much sweeter than the normal sweet potatoes. Zue, remember we saw some at the vietnamese store but dah tak cantik that is why kita tak beli. Next time you pergi situ, check and see ada tak. This is Japanese Sweet potato. Beachlover, I too crazy over this sweet potato. Is really sweet especially if you roast it. As far as I know if you mix green and red it will become purple. But is weird the water turn green. If only we lived closer, Gert. Your purple ondeh-ondeh, simpan 10 bijik for me... Rain check, ok?? 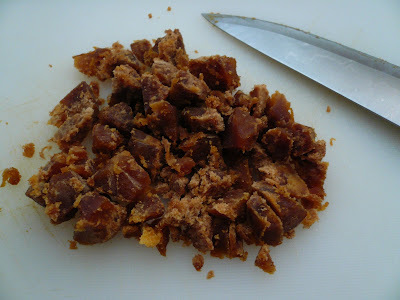 Yum, ondeh-ondeh, I love it when the palm sugar just burst in my mouth! 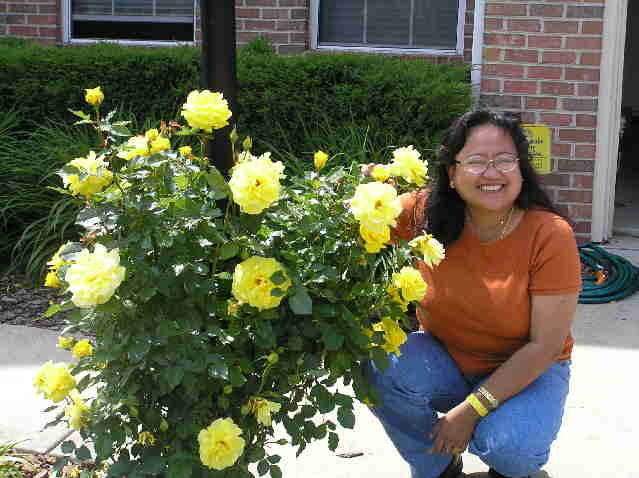 hmm...nice color la gert...soo tempting. it doesnt look purple from d outside eh! u mix it with tepung gandum? 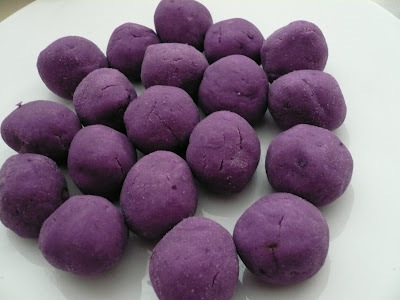 not glutinous flour like kuih buah melaka tu? Jun, I mix with tepung pulut but not much. 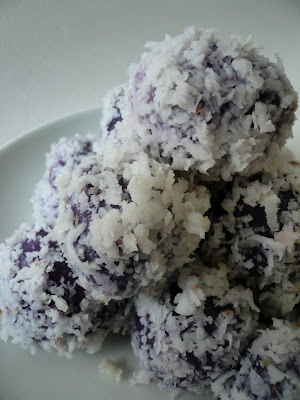 This ondeh ondeh/buah melaka keep really well. Is still soft on the second day. I am going to try out your tempe chili hijau recipe. Jun apa tu 'kecipir'? hmmmsooo malas to go to the shop to buy sweet potatoes..
purple, green ondeh ondeh - I don't are what colour they are I just love them. No idea why the colour turns green. 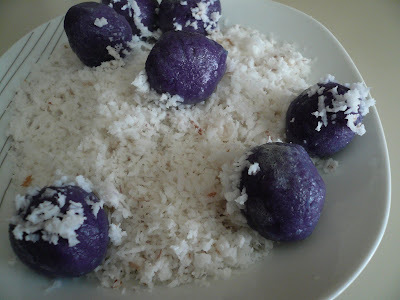 I have tried purple sweet potatoes before. They have a real soft texture. And they turn the water I boil them in puprle not green. There is a rumour that farmers inject dyes to obtain that colour. No idea how true that rumour is though. 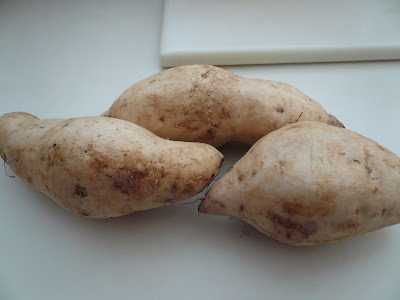 drNo, is hard to find white sweet potato here. Mostly orange in colour. Since I found these so I decided to made into ondeh ondeh. Gert, if I am correct, they call it winged bean for kecipir or kacang botol. Thanks Zue. Too bad we can't find any kacang botol when we went to the vietnamese store the other day. Gert .... de-ja-vu in Seattle! 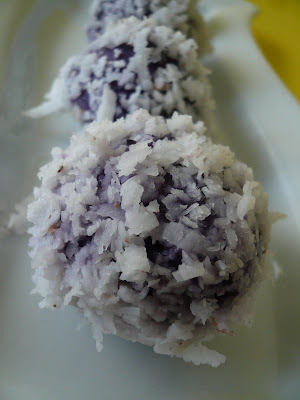 My sister made purple ondeh-ondeh in Melb a while back that looked exactly like yours, right to the grated coconut pieces because no electric spinner like those we have back home. Is yours done the same way? How do you scrape the coconut out of its kernel? I asked David why your water turned green, he said something to do with its PH and explained it but I tak dengar all of it .... LOL! The purple color in vegetables is a result of a pigment known as anthocyanin which are also antioxidant flavonoids that protect many body systems. Anthocyanins are sensitive to acidity and are are extremely water soluble, changes in acidity (pH) cause the compounds to alter their structure. The compounds change and the acid is evaporated off the surface of the potato into the water. Anon, thank you for the explanations. urs is beautiful! i just use normal sweet potato and mine turned out to be dull yellow. Karen, you have to add glutinous rice flour to the mashed potato. The amount of flour depend on what type of sweet potatoes you use. Some might need more and some need less. 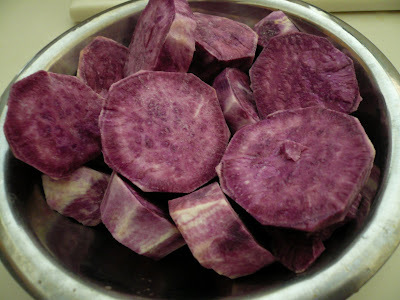 Regarding the green color, the sellers of Stokes Purple potatoes write that when making things with purple potatoes and baking soda or baking powder, the baked products sometimes turn green. This makes me guess that it's the alkali nature of baking soda that does it. Also, the water in parts of the midwest and the west in the US tends to be alkali (due to calcium carbonate, a.k.a. limestone in the soil), so maybe if the water in your neck of the woods has a pH much above 7, that's what's causing it. Looks nice. Can you share the recipe? :)Thanks.